Spanning both UWM’s main campus and Milwaukee’s East Side, Peck School of the Arts maintains a multitude of creative maker spaces, performance halls, innovative research centers, digital labs and other facilities critical to the needs of 21st century artistic teachings and practice. Opening Soon: A flexible technologically-integrated performance venue that will choreograph light and sound in as many unique ways as the diverse group of university and community artists it aims to serve. Named after artist and UWM Department of Art & Design alumna, Jan Serr, the school’s new flagship venue will provide a much welcomed home for contemporary and interdisciplinary artists. Set to unveil in four phases, state-of-the-art facility updates will include 300-capacity flexible theatre seating, HVAC-controlled sprung floor, acoustic-tempered digital sound capabilities, state of the art projection, adjustable panels, and more.As the leading comprehensive arts school in Wisconsin, Peck School of the Arts’ Jan Serr Studio is committed to meeting the evolving needs of 21st century artistic teachings and practice. The mission of the Arts Center Gallery at the Peck School of the Arts is to serve as a teaching and professional research laboratory. It provides a year round setting for the exhibition of work by students, alumni, special guests, thesis exhibitions for the undergraduate and graduate program, the biannual Department of Art & Design faculty exhibition and the spring undergraduate scholarship competitions. The gallery has 3516 square feet and is split into four adjoining exhibition spaces. Exhibits generally rotate on a monthly basis from September through May. All exhibitions and artist lectures are free and open to the public. A well-equipped undergraduate facility is located in the campus Art building. Three classroom areas with worktables, electric and kick wheels, slab roller and extruder allow exploration of a range of ceramic work. The facility includes a clay mixing room, well-equipped glaze room with spray booth, and a separate mold making area. The undergraduate facilities house two kiln rooms with four large Bailey downdraft gas kilns ranging from 28-48 cu. ft. in capacity, five electric kilns ranging from 7-16 cu. ft. in capacity, and a raku kiln. A course in wood firing is offered annually at the university’s collaborative wood kiln site at the University of Wisconsin-Waukesha Field Station in Waterville, Wisconsin, a short distance west of Milwaukee. The wood kiln is a 120 cu. ft. Anagama design. The kiln site also includes a small bourry box wood/salt kiln. Facilities include several digital labs, a letterpress studio, and large critique and classroom spaces. A 2,500 ft2 CAD/FAB LAB contains eighteen PC workstations with 3D Connexion mice, a digitizing arm, a Sense handheld 3D scanner, a Next Engine HD 3D Scanner, several Rep Rap based 3D printers, three Makerbots, a Form 1 SLA printer, a ZCorp 402C 3D printer, a Wacom tablet, a vinyl cutter, two Potter 20 ton hydraulic presses, two Shapeoko CNC routers, three mini lathes, two mini milling machines, an acrylic bender, a bending brake, a bench shear, a drill press, two flex shafts, a powder coating set-up, anodizing baths and dies, and basic hand tools. A 625 ft2 CAM/FAB LAB contains a vertical metal cutting bandsaw, a horizontal metal cutting bandsaw, three Beaumont metal grinders, a drill press, a manual tool room lathe, two vacuum formers, a sandblast cabinet, several numeric controlled machines such an 4’x8’ CNC router, an Epilog laser cutter, and a Tormach PCNC 1100 (capable of machining aluminum, steel, and titanium), and basic fabrication equipment. Students have access to our Equipment Room to borrow gear for a variety of different projects. Equipment and facilities include: Fully equipped Dye and Screen Printing facilities; Structural Fibers Lab with computer-operated dobby looms, 20+ floor looms, computerized sewing machines, industrial sewing machine and access to spinning wheels, feltmaking equipment; and Computer Lab/Library equipped with Macintoshes, peripherals, and fiber reference books. Located in the Kenilworth Square East Arts Research Complex, the Immersive Media Lab contains private secured 24/7 access to space for students, research staff, and faculty. Currently we conduct immersive research with an array of 3D Modeling software from companies like The Foundry UK, Autodesk, Unity, Unreal, and Adobe among many others. We have 2 Oculus (DK2 and CV1+Touch), and one HTC VIVE. Students and researchers can use a dedicated experience computer or a powerful rendering laptop to conduct research. Large displays, multiple projectors and media players, and iPad round out our hardware options at the moment. The well-equipped comprehensive undergraduate Jewelry and Metalsmithing studios are housed in the Art building. The facilities include equipment for forming, casting, enameling, etching, patination, polishing, fabrication, hydraulic forming, machining, anodizing, milling and lathwork. In addition to the main studio with 18 shared workstations, three adjacent rooms feature 20 individual stations for Jewelry & Metalsmithing concentration students. A very large array of metalsmithing equipment is available as well as many other hand and power tools. Some undergraduate courses also take advantage of the newly renovated and equipped Kenilworth facility, with a comprehensive forming studio, welding, and powder coating. In addition to the Art Department free photo documentation lab, students also have access to Jewelry & Metalsmithing Area Photo equipment. Built in 1914 as a Ford Model T plant, Peck School of the Arts’ Kenilworth Square East building was acquired by in 1971 and redeveloped in 2006. In a first-of-its-kind partnership with a private developer, the university restored the first six floors for use by the students and faculty of the Peck School, including the ground level gallery space. Studio facilities include a life-drawing theater style studio, introductory and intermediate level painting studios, multiple purpose drawing studios, ongoing and secure display cases, slide and visual resource digital projection room, and assigned individual workspaces for students at the Advanced Painting level. Facilities include a traditional black & white darkroom capable of accommodating 18 students, 5 film processing rooms, a digital imaging and output lab equipped with 10 Macintosh stations and small format printers, a 44” wide-format Epson Stylus Pro 9900 printer, 3 high-resolution scanners, a multi-purpose finishing/dry space, secure display cases with rotating presentations of student work, and two lecture classrooms. In addition, the area has large-format camera and location lighting kits available for checkout by advanced photography students. Undergraduate photography facilities are located in the basement of Mitchell Hall, room B84. Studios occupy over 6000 square feet, and include specialized facilities for water-based screen printing, intaglio, letterpress, lithography, relief/monoprint, photo and digital printmaking. The shop is available 24 hours a day, 7 days a week for graduate students and until midnight for undergraduates. Faculty have studio/offices adjacent to the printshop and use the facility to produce their own work. Our nearly 6500 sq foot sculpture facility houses a complete woodworking studio, a 15ft x 15ft spray and sanding booth, large metal fabrication and construction area, plaster, mold-making and ceramic shell areas and a foundry and wax working area, There are also several general work areas, a 800 sq ft installation and project space and access to digital media. The UWM Studio Arts & Craft Centre offers engaging classes, workshops, and events within a positive studio atmosphere and is dedicated to the education, enrichment, and creative fulfillment of all members of the UWM community. The SACC provides open studio space, as well as specialized studio equipment for ceramics, photography, fibers, metals, and printmaking. The Kenilworth Square East Building, a six-floor, 500,000 square foot artist’s warehouse located on the East Side of Milwaukee offers studio space for both faculty and graduate students at a discounted rate. Kenilworth is also home to a gallery space, a screening room, various installation sites and studio facilities. It is in a thriving neighborhood of coffee-shops, bars, restaurants and movie houses, and is next door to a graduate housing facility. The Kenilworth facility, shared by the Jewelry & Metalsmithing Graduate students, features 4 individual work stations, soldering and annealing areas, basic metal fabrication tools, hydraulic die forming, enameling, powder coating, sandblasting, welding and forming equipment. In addition, graduate students have access to the comprehensive Jewelry & Metalsmithing undergraduate facilities in the Art Building. There are well-equipped studio facilities that offer access to a wide range of tools and equipment in each disciplinary area. These studios and labs are housed within our campus buildings, as well as within our new Kenilworth facility. Graduate photography facilities include a dedicated black & white and alternative process darkroom, digital imaging and output lab with 1 Macintosh station, Epson Stylus Pro 4880 printer, and Epson Expression 10000XL scanner. The Department of Dance boasts 3 dedicated performance spaces, 7 large rehearsal studios equipped with sprung floors, mirrors and audio/video technology, and a pilates lab. Opening Soon: A flexible technologically-integrated performance venue that will choreograph light and sound in as many unique ways as the diverse group of university and community artists it aims to serve. Named after artist and UWM Department of Art & Design alumna, Jan Serr, the school’s new flagship venue will provide a much welcomed home for contemporary and interdisciplinary artists. Set to unveil in four phases, state-of-the-art facility updates will include 300-capacity flexible theatre seating, HVAC-controlled sprung floor, acoustic-tempered digital sound capabilities, state of the art projection, adjustable panels, and more. As the leading comprehensive arts school in Wisconsin, Peck School of the Arts’ Jan Serr Factory is committed to meeting the evolving needs of 21st century artistic teachings and practice. A 292-seat thrust theatre with variable proscenium configuration abilities, an extensive sound system, and a computer controlled 384 dimmer lighting system. A 100-seat black box theatre that doubles as a dance teaching and rehearsal studio when not set up for performance. The theatre is located in Mitchell Hall at 3203 N. Downer Ave.
For a $25 per production course, per semester fee, students receive unlimited in-house processing for 16mm black & white reversal films. Film processing runs occur about four times per week during the fall and spring semesters. One Oxberry 16 animation stand & one Marron Carrol 16/35 animation stand are available. There are two Mitchell 16 cameras dedicated to animation. A mirror table is available for multi-level cutout animation. The studio has drawing compounds and rotoscope projectors. “Video Lunchbox” digital frame recorders are on hand for video assist. In cooperation with the Golda Meir Library, the UWM Film Department houses a large collection of independently produced 16mm fine art films. Public Screenings of these films occur regularly in the UWM Fine Arts Cinema and VHS copies of most of the films are available from the Media Services window in the Reserve Section, East Wing, of the Golda Meir Library for students to view and study. Supports post-production sound design and final mixing for films and videos. This lab is an Apple computer/Logic Audio-based lab with surround sound capability. There is an analog recording studio comprised of a Tascam TSR8 recorder,16x8x2 Allen & Heath Mixer, a sound isolation booth and assorted signal processors. Large diaphragm condenser and dynamic microphones are available. A 100-seat, sloped-floor cinema with comfortable seating and Xenon-Arc film and high-resolution video projection. Works by visiting artists, faculty & students, as well as prints from the Cinema Arts Archive are screened regularly. A 24′ X 36 space with lighting grid and Mole Richardson fixtures is located in the basement of the Music Bldg, Room B-60. In addition to full wet lab facilities, students have a newly renovated digital lab with input/output devices, including multiple printers. Optical Printing High Quality 16mm optical work can be achieved with the Research Products printer and the Acme camera. Students also have access to two 16mm/Super-8 JK printers. An art house cinema with nightly screenings is managed and programmed by our graduate students. There are two annual cultural events at the Union Cinema connected to the Film, Video, Animation and New Genres department: the Milwaukee LGBT Film & Video Festival, and the Milwaukee Underground Film Festival, which runs as a course in the department every spring and can be taken for credit as a graduate student. Additionally, there is a weekly screening series at the Union Cinema called Experimental Tuesdays. A Final Cut Pro editing lab with Apple G5 computers form the base of the editing lab. Record decks, basic film to video transfer equipment and dvd burning facilitate use and creation of a variety of video formats. (20) Macintosh (g5, g4) based workstations supporting a variety of applications for audio, video and multimedia production and post production. In addition to Macintosh-based non-linear systems, students have access to 4-plate and 6-plate Steenbecks for 16mm film editing. A six deck 16mm Mag Interlock System is available for multiple track transfers to digital audio workstations. Student film and video projects are also supported by access to hundreds of small but essential parts and accessories too numerous to name. This equipment can range from specialized lenses to the ordinary audio adapters. The designated rehearsal space for the department’s early music ensemble, Collegium Musicum, the room includes a pipe organ and two harpsichords. Several studios at both the UWM Music building and our Kenilworth Square East location support the creation of new electroacoustic works, and facilitate a broad range of activities including instrument design/development and multimedia collaboration within Peck School of the Arts. Studios at Kenilworth Square East also provide flexible, multipurpose spaces for recording, rehearsal, installation, and teaching. The spaces include a large rehearsal room, isolated control room, and 5.1 mixing / listening room. A state-of-the art venue home to the critically acclaimed Fine Arts Quartet, the “Zelazo Center” boasts a grand entrance, two elaborate stained glass displays, as well as exquisite molding, arches, and decorative elements. The Zelazo Center includes the 758-seat Helen Bader Concert Hall, a large ensemble practice ballroom, an intimate chamber music recital room, and six new warm-up/practice spaces. A dedicated 20-station lab equipped with Macintoshes is available to music students on the 2nd floor of the UWM Music Building. Located in the second-floor east wing of UWM’s Golda Meir Library, students enjoy access to an extensive music library, including printed & digital scores, CDs, LPs, books about music, and streaming audio. 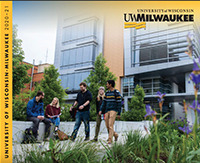 More than 60 private practice rooms are located in the UWM Music Building and the “Zelazo Center”. Our main concert space for chamber ensembles, master classes, solo faculty and student performances, as well as convocations. The 300-seat hall includes an open stage, state of the art recording technology, and two Steinway concert grand pianos. A spacious 20’ x 50’ workspace that includes four cutting tables, a variety of industrial sewing machines and surgers. Adjacent to principal and chorus dressing rooms, the shop features a separate fitting room, wardrobe maintenance space, and craft areas. A safe, ventilated space for fabric dyeing and painting, mask making, casting, and upholstery activities. Commercial dyeing equipment and a walk in spray booth are located in the 32 ft. x 38 ft. space. A designated instructional and drafting workspace featuring 20+ drafting tables. A 100-seat 50’x50’ black box theatre outfitted with a facility-wide lighting grid. Manufactured seating risers provide easy reconfiguration of the performance space. Located on the fifth floor of our Kenilworth Square East building. A 525-seat thrust theatre with variable proscenium configuration abilities, an extensive sound system, and a computer-controlled 384 dimmer lighting system linked by ETCNet and DMX control wiring and served by an 800 amp. The thrust stage is made up of seven individual elevators that may be used at varying levels depending upon production requirements, and a full-stage grid supports a 27-line counterweight rigging system accessible from fifty feet above the stage. A large 20’x36’ space dedicated to props production contains tools appropriate to furniture construction and carpentry. Three acting and rehearsal studios outfitted with adjacent lockers and shower facilities, and sprung dance floors. The 30 ft. x 80 ft. main shop contains professional woodworking equipment with easy access to stage and loading dock. The ventilated welding room contains MIG and stick welders. A separate storage space above the welding area contains an extensive range of rigging equipment. Located in our Kenilworth Square East building, this lab interfaces elements of sound design, video, and lighting. The space features an acoustically treated recording studio and 25 foot square lighting and projection space split by a spacious control room. Maximized for use by students with laptop computers, the space features high speed digital connectivity, software synthesizers, multi-channel digital interfaces and traditional hardware signal processors. Large format displays and powered audio monitors replicate theatrical systems for cutting edge show control programming, greatly expanding the capabilities of performance and artistic flexibility. A dedicated studio adjacent to all production areas that provides desk and workspace for all stage management students.